I designed a battery spot welder HERE and had many requests from people to design a pulse arc welder to weld and repair jewelry. These welders are like small TIG welders that will produce a very hot plasma flame and basically melt all type of metals like gold, silver, aluminum etc together. This welder will be adjustable from 0 to 250WattSecond and will have certain adjustments that will make it possible to also weld metals that are very hard to weld. 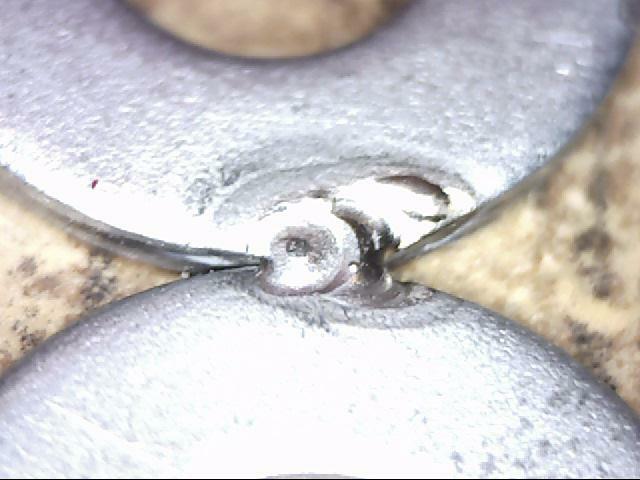 In a previous attempt I tried to use my capacitor discharge welder to achieve the above and believe it or not I did manage to make a couple of successful welds. 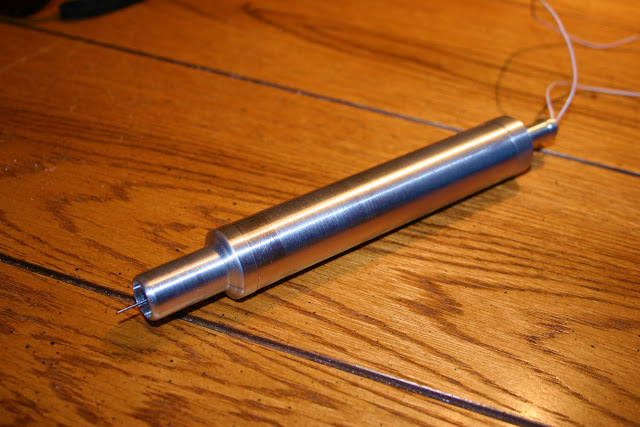 I machined a stylus and mounted a solenoid with a collet and a tungsten electrode inside the stylus. The stylus also has ports for argon gas to shield the weld from the air around it producing a very clean and shiny weld. 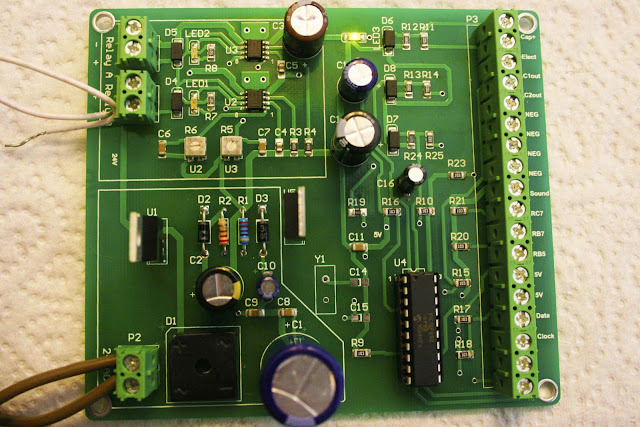 I also designed an electronic board with two Pulse width modulated relay driver circuits to operate the two solenoids. This board has a microprocessor that will determine when the electrode touches the work piece to energize the argon solenoid and pull the electrode back. 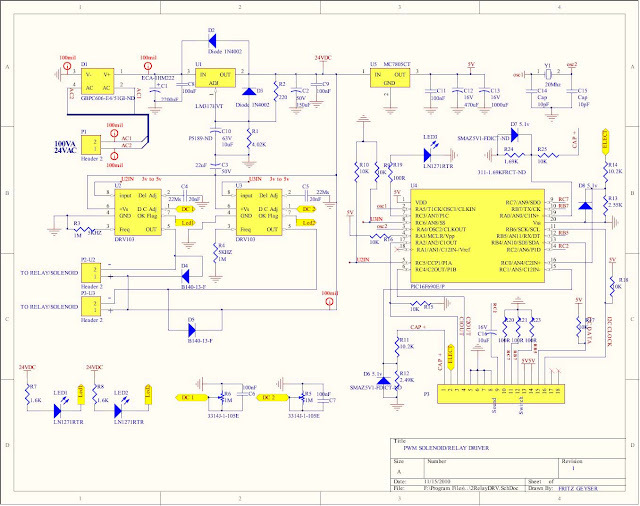 I can hear everyone asking, why a relay driver circuit and why do you need a processor to energize these solenoids? Why can't you just do it with a switch? 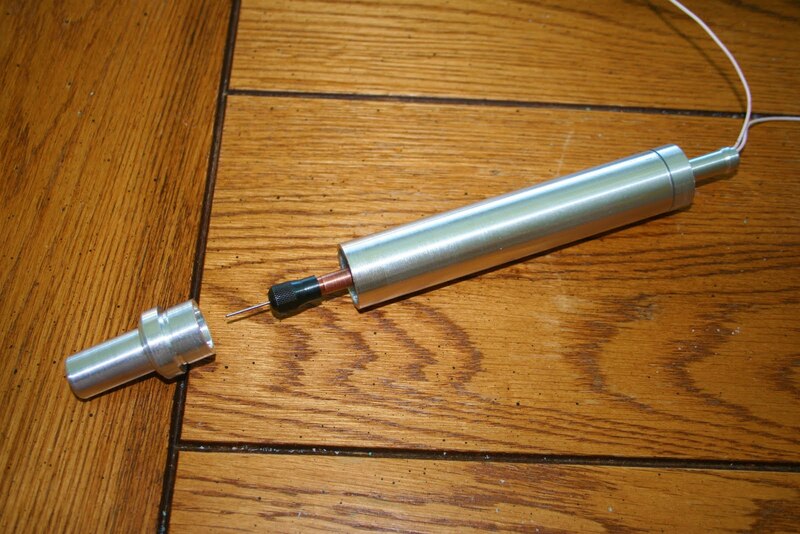 A solenoid however is very slow. We are talking "PULSE ARC" and with the pulse I mean, energizing an electromagnet, waiting for the buildup of a magnetic force, retract an electrode away from the work piece, firing a pulse, creating an arc and getting a plasma flame lit, all within 0.1 thousands of a second(MIN) to 40 thousands of a second(MAX). 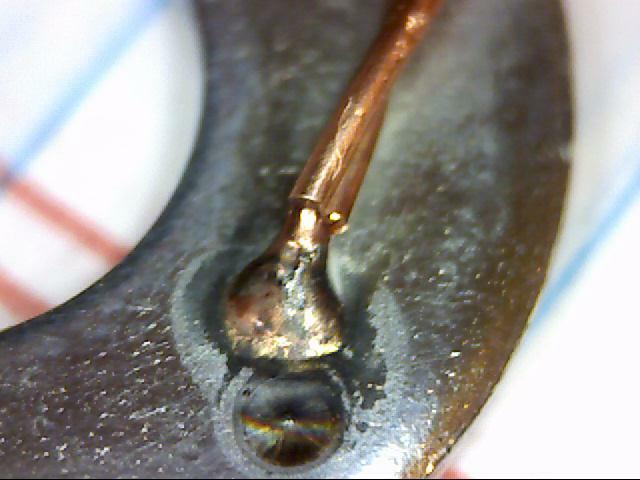 Clearly, a switch is not going to work here, we need a fast processor that will calculate the resistance between the electrode and the work piece as it moves away and then fires the pulse at the right moment or the electrode will get burned to the work piece, contaminating and ruining the weld. 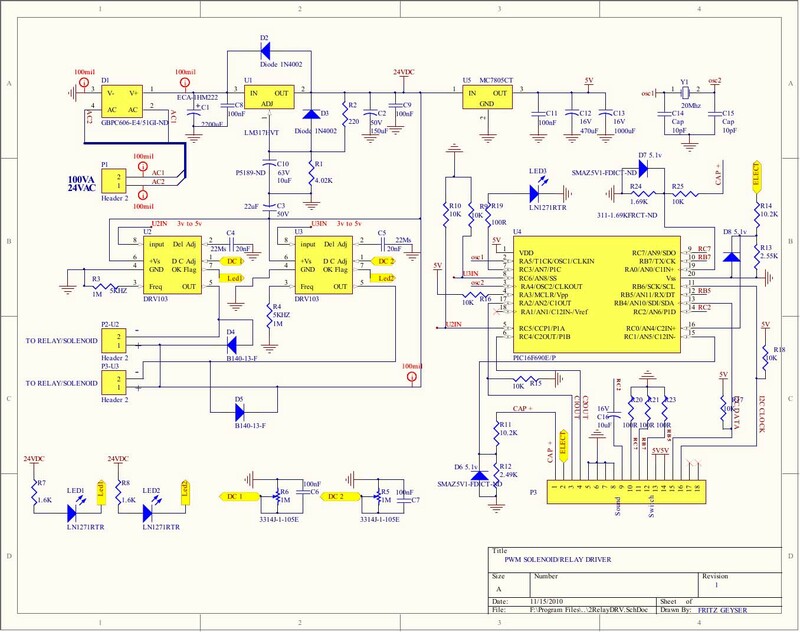 Here is the prototype microprocessor relay driver board(Schematic above) that I will be using to energize the argon gas and electrode solenoid. The processor will calculate the exact moment to fire the mosfets which will ignite a very controllable plasma flame. I included a flashing led(LED 3) to indicate if the processor is running for trouble shooting purposes. I spent the last two weeks building a small mosfet board to fire the biggest of 7 capacitors. I also changed some of the components on the board above for the new voltages this welder will be using and ordered a capacitor from China, which at NO SURPRISE IS 35% smaller than advertised. I noticed that one of the readers of this blog already said that he hopes this project does not takes as long as my Capacitor Discharge project. I guess he meant it good and was trying to say that he is really interested in this project and in an hurry to start to use it. Designing and building something like this takes a lot of time and money. I am working on a budget and trying to make time for this project between work and Family so please be patient. the oscilloscope graph above is from the relay board firing a pulse while the electrode is moving away from the work piece. The red graph(5Volts/ block vertical) is the electrode touching the work piece +- 18 Volt and then moving away, going down to 0 volt In about 25 micro seconds(25 millions of a second.....Measured between the blue vertical lines). The processor is doing calculations while the electrode is moving away and fires a very repeatable and precise 5V pulse (Yellow Graph 1Volt /block vertical) at about 14uS before the electrode completely disconnects from the work piece. This pulse will ignite the plasma flame and is software adjustable. Any donation will speed up this project and will be very appreciated, thank you. If You need tester - I'll be happy to help. I hope that building new unit won't take that long as resistance welder. This will be great! I'll be waiting for more info on this gadget. I'm glad that you are still improving "Pulse Arc Welder" - I can't wait to see the progress. I've already worked with the Chinese welder machine, but I have sold it and currently I have "Pulse Arc Welder" made by ABI. This version has welding and capacitor discharge machine in one casing. I have to admit that it's an interesting solution, but it also has disadvantages. If you're interested in this design just let me know and I'll send you pictures. I can also help you with practical matters, because I'm a jeweler. I wish you all the best in your further work. Thank you Bogdan, I sent you an email. Welder "I see a welding device that works with China fabracion to not oxidize argon welding. I have seen that is an option for about $ 350, but not if it is a good investment. I could comment on the Chinese appliance you had to weld? the price and quality model and if it really served to do repaciones silver and gold jewelry such as rings welded, put as rings, welded parts? Вы закончили проект ? Купить можно ? Let us know if you are offering the kits for the DIY pulse arc welder also alongwith your CD welder. If so let us have payment details.